Alice Cooper is an American treasure and he knows it. Once the viscous, drunken villain of rock and roll and a threat to the very decency of our moral foundation has transformed into the clean and sober fist-pumping defiant champion of our hearts. “I’m lovable,” he says with a mischievous chuckle. But then Alice Cooper may not be in the mood to return the favor. Rebuffed by the Rock and Roll Hall of Fame for decades, he was granted entry last year as the pioneer member of what he calls “the lunatic fringe” that will break the seal and let in all the maniacs. He’s also quite miffed at what passes for “great rock and roll bands” these days. Currently sharing a tour with Iron Maiden, (one of the “lunatic fringe” long ignored by the elitist rock press) he is riding high after the recent popularity of his sequel to the legendary Welcome to My Nightmare (Welcome 2 My Nightmare), a title which he thinks is “so damn clever”, the soon-to-be released on DVD for the first time, “The Strange Case of Alice Cooper” and an enormous box set called “Old School”, which features a healthy sampling of the vicious, drunken villain days. The Coop took time for our second chat in the last few years after a rigorous round of golf and a yearning to get back on the road by his lonesome later this summer into the fall. The first question I must ask, and it has to be framed as any self-respecting Alice Cooper fan would: How important does the Rock & Roll Hall of Fame feel that it now has the great Alice Cooper as one of its own? What I think it did was open the door to acts that were probably gonna have a hard time. When you get an Alice Cooper in it kind of breaks some new ground in there for bands like KISS or Iron Maiden. Even though we sold fifty million records, I mean, we had all of the qualifications to be in; it’s just that Alice Cooper’s image was that of the outsider and I think there are a lot of bands that are outsider bands. As commercial as KISS are, they’re an outsider band. So I think us getting in opened the door for harder rock bands. For a Seventies kid, I mean, ignoring Alice Cooper? I know you had the theatrics, which unfairly always seems to put you in danger of the novelty label, but what you guys did as a band and your solo work defined rock music for that generation, especially as innovators. It’s as if the voters feel the need to ignore the impact of that period and the bands that dominated it. Far more important for me was the music. It’s nice to have all the trappings and we did break a lot of ground when it came to our kind of shows, I mean nobody had ever even used up-lighting or down-lighting before us. We were the first ones to use truss lighting, which is still a big influence on what’s going on today. But the fact that the songs and the albums still hold up, I think it finally proves what we said all along: We spent ninety percent of our time on the music and like ten percent of the time on the theatrics. The theatrics came easy to us. It was the music that we really had to work at and I think we’re being cited for the music as much as anything else. The music triggered a great deal of the theatrics from the beginning. Each of your albums always appeared to have a theme and a different characterization of the Alice that would inform the shows. To me, I don’t know why and I don’t know how, but I’ve always thought of everything in concepts from the very beginning. It always seemed to me that any song is conceptual. For instance, if you come up with a title, any title at all, I don’t care what it is, it could be “Welcome to My Nightmare”, so write a show around that. “Welcome to My Nightmare”? Okay, what does it consist of? All right, we’ve got a little kid that can’t wake up from his nightmare. Okay, that’s good, now what happens to him? So for me, right there, I start writing out the whole idea of the story and then I start filling in the details as songs. So, okay, there’ll be “Cold Ethyl”. She’ll be this fantasy love character and maybe she’s dead. I don’t know; let’s make that part of the nightmare. “Only Women Bleed”? Let’s make that part of the nightmare. It was always like that for me. I can’t not think in terms of concepts. It’s automatic to me. I think every album I’ve done has been a conceptual album in my head. There was a great deal of pressure on you when you went solo with the original Welcome to My Nightmare, which was a Herculean undertaking; a multi-media idea from album to concert to film, etc. and I always tell bands this, and I just told the graduating students at the Music Institute out in California, “Here’s your choices; climb out on the limb and you’re either going to be a genius or an idiot.” (laughs) You know, go out as far as you can on that limb and either be a genius or an idiot. If you’re an idiot, you fall off the limb and then you climb the tree and do it again. There’s nothing that says you can’t climb the tree again. But whatever you do, don’t stay in the middle. Never stay in that gray, mediocre area. Go out and do something that’s gonna startle everybody or that’s gonna make everybody think of you when they think of that. So Welcome to My Nightmare was one of those defining moments of “I talk the talk, am I gonna walk the walk?” And Shep Gordon (longtime manager) and I and Bob Ezrin (longtime collaborator and producer) put all of our money into that show and if it would have been a failure we would have had to start all over again. And you know the brilliant duality of what you just said is that in that show you are both the idiot and the genius. And you know, I always have been. I’ve always wanted Alice to be this arrogant villain that’s also vulnerable. In other words, he may be – and I always liken him to an Allan Rickman type, you know, “Cancel Christmas!” that kind of overblown villain. But you just know at some point he’s gonna slip on a banana peel. (laughs) And at that moment, how does he recover? That’s the humor of Alice right there. Sure, and you had mentioned the last time we spoke of the two Alices; the one when you were drinking heavily, the victim, and the one now that you’re clean and sober, the fist-pumping defiant Alice. When I look at video from back then I see him as a total victim. Even his posture was a total victim’s posture and what was he singing about? What was happening? He was the whipping boy. Everybody hated him. And a lot of kids on the outskirts really related to that. They related by saying, “I’m that guy. I’m the one everybody hates. I’m the one that doesn’t fit in”, so he was sort of the poster boy for all the misfits. So when I got sober I said, “I really don’t want to be that guy anymore. Now I want to be the guy who’s the controlling villain. I want to be Moriarty now, play Alice like that, and I think because of that transformation Alice has gotten a whole new life. 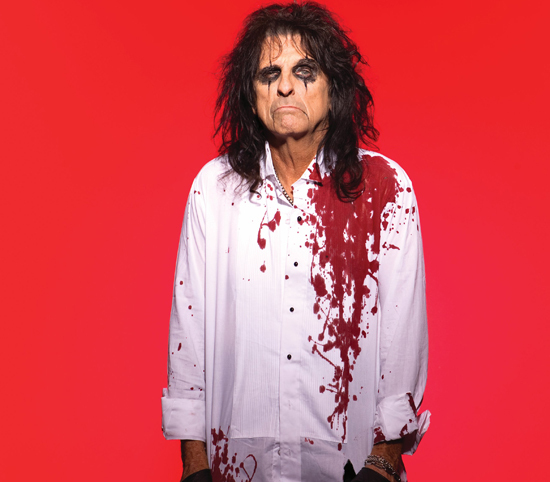 How has Alice Cooper stayed in the public conscience for so long? My four year-old daughter loves Alice Cooper. He is ingrained in the fabric of our culture. Where do you think Alice fits into our collective subconscious? I think what it is, Alice was young and dangerous and vicious, and now Alice is more of a Vincent Price. I think Alice is woven into the conscience of America. I’m sort of an American treasure now. (laughs) The same way Iggy Pop is, guys like that who survived forty-five, fifty years in the business and they’re still doing it and just keep going. I think we’re not as dangerous as we are lovable. And that’s a great thing. It’s fun for me. I don’t feel the pressure of having to outdo myself anymore. I mean, we’re clever enough to make the show clever every time, but I’m not trying to outdo Nightmare. I talk to Steven Tyler, Iggy, Ted Nugent, all the guys who were the big image guys, and they’re all looking around goin’, “What happened to rock and roll? When did we get so pabulum?” You know, there are a few; the Foo Fighters are great. The Foo Fighters would have fit right in during the Seventies. I mean, they’re a Seventies band. Jack White challenges everybody. I love that guy. But I look at the charts or the cover of these magazines and the headline is “This is the greatest new band” and I go, “There’s an accordion in this band! There’s a ukulele in this band!” What’s wrong with these people? (laughs) Honestly! So as long as they’re gonna do that, then bands like Aerosmith, Alice, Ozzy, The Rolling Stones, whoever it is, are going to keep chewing up the landscape. ‘Cause I’m not backing down! I’m gonna do the hardest show I can do. I’m gonna do the most edgy show I can do. I give credit to Dee Snider. I give credit to Rob Zombie. Those are guys who finally got their teeth into this thing. If it’s gonna be a show, make it a show! Boy, am I disappointed when I look around at some of these new bands. Wow, do we need a shot of adrenaline. Speaking of which, you’re on the road now with Iron Maiden. Will the Alice Cooper fans get their just deserts? Well, actually the new show won’t start ’till October. When we’re working with Iron Maiden as the guest stars, we’re only doing an hour. We’re going to be doing some of the theatrics, but all of its going to be the biggest hits. This band I’ve got is great. Ryan Roxy is back. I’ve got Oriente, Tommy Hendrickson. So I’ve got three great guitar players right there, and I’ve got Chuck Garric on bass and Glenn (Sobel) on drums and it’s gonna be a really tough, good band, and to me that’s all I can really do on this show. We’ll do some theatrics, you know, we’ll have fun with it, of course, but when we go out in October with our own show, basically it’s going to be an entirely new show. All right, we’ll have to talk then. You’ll have to give me all the details. Yeah, yeah, and honestly the stuff that’s being built right now and the stuff being put together for that is really exciting. We’ve had meetings with directors and stuff like that and it will be something that will really make people smile, ’cause it’s pure Alice.